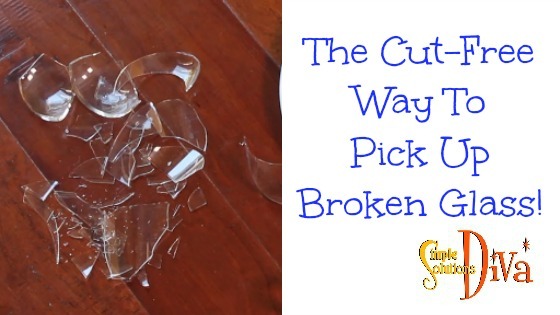 Who hasn’t broken a glass or dish and had to deal with all the little shards of glass? Well, the Diva has an easy way to clean up that mess, and you won’t need a bandaid afterwards! Halloween is almost here! 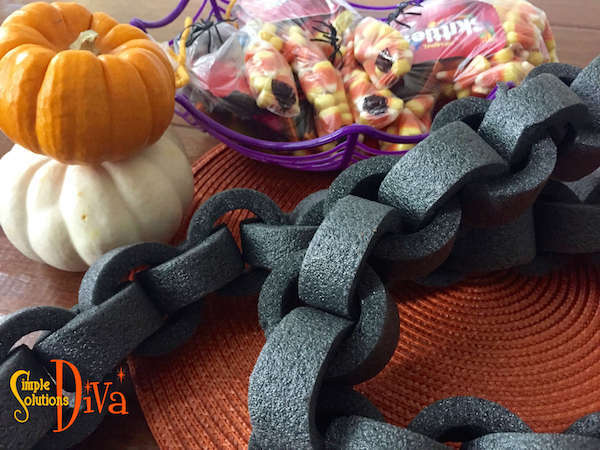 Whether you are going to a Halloween party this year or you are hosting one this weekend, the Simple Solutions Diva has some simple Halloween snacks and décor you can make yourself! 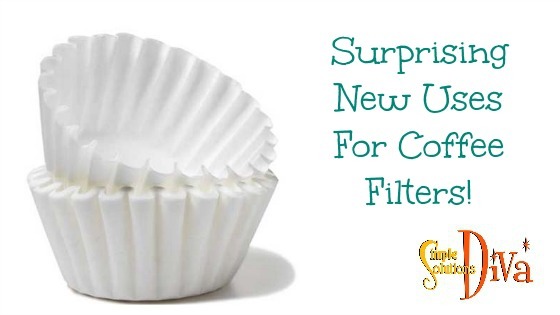 These are as simple as 3 ingredients – and they aren’t full of sugar! 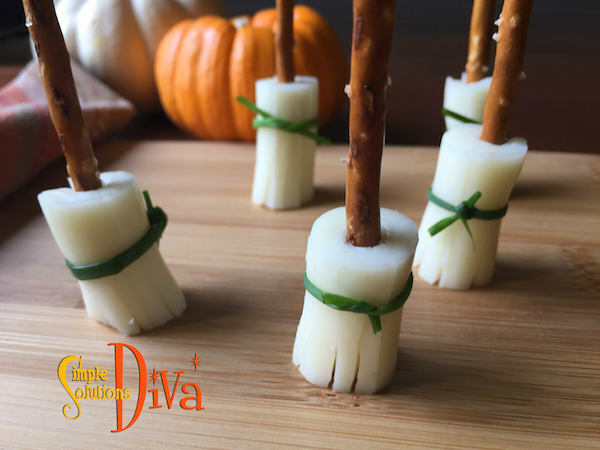 String cheese, pretzel sticks and fresh chives make up this adorable and tasty Halloween treat! Instructions – Cut the string cheese into thirds. Slice the pieces of cheese 2/3 of the way to the top, creating the bristles of the broom. Stick a pretzel stick into the top (uncut) side of the broom. Tie the chive just above the cuts of the “broom” bristles. Keep refrigerated until ready to serve. 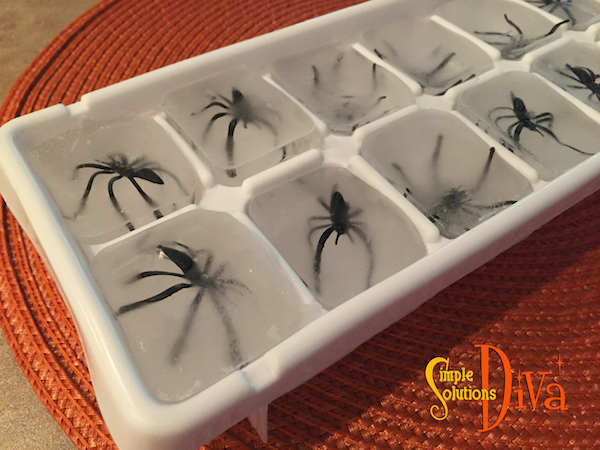 Create a surprise in your party cocktails with these creepy ice cubes! 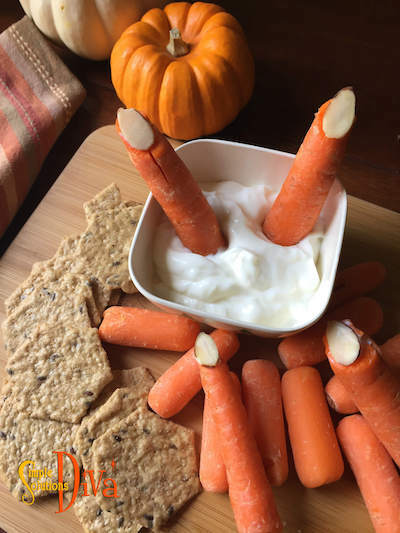 Carrot Finger Food – “Don’t Stick Your Fingers in The Dip” doesn’t apply here! Carrots carved into fingers, complete with slivered almond nails, make the perfect “Finger Food”! You only have to create a few to make the impact. Stick a few in your favorite dip and place them in and around the other veggies you supply with the dip! Instructions – Peel and wash the carrots. Cut the carrots into finger-sized pieces. 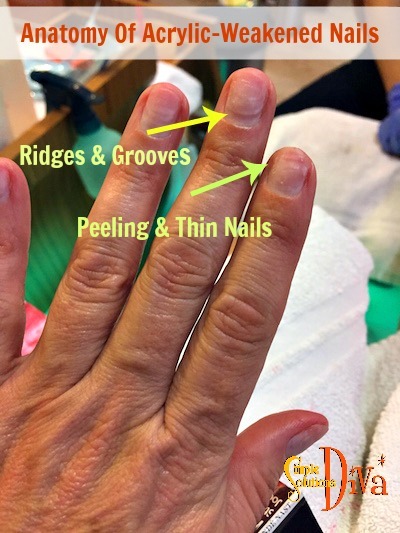 Using a knife or a vegetable peeler, carve out a “nail bed”. Secure the almond “nail” with a dot of sour cream. These make for some great table decor or to make your home look creepy. Simply purchase foam pipe insulation (it is dark grey). Slice the insulation into small rounds – these are the chain “links”. Attach the links together to make a chain. 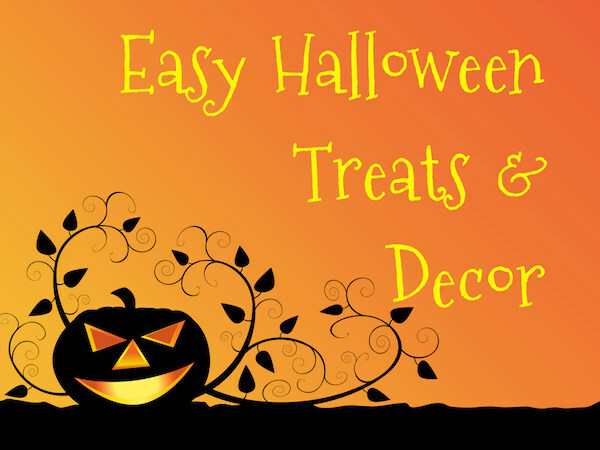 Hang on your stair railing, decorate your Halloween party table, or use as part of a costume! If you do decide to use them as part of a costume, you will want to secure the links closed using a hot glue gun (low temperature). You can find plastic gloves at dollar stores or in the grocery stores. 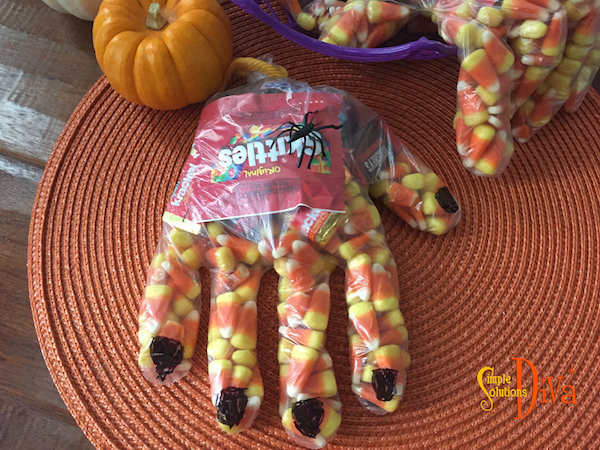 Simply fill them with favorite Halloween Candy and close and secure the bottom with string, yarn or twisty-ties. My Confession: Sometimes, my projects don’t go as planned! Originally, I was going to create a paper mache pumpkin using yarn instead of paper. But honestly, it just didn’t work! The yarn stuck to the balloon – I couldn’t deflate the balloon without ruining the “pumpkin”. As I tried to figure out what else I could do, I realized the ball of orange yarn looked exactly like a pumpkin! So I added a pipe cleaner stem and leaf and, Voila! 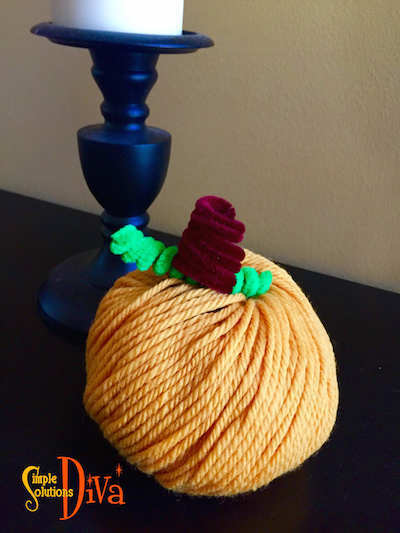 A cute yarn pumpkin! Couldn’t have been easier! Thank you to WTLV-TV/NBC 12 First Coast Living for inviting me on to share these ideas! 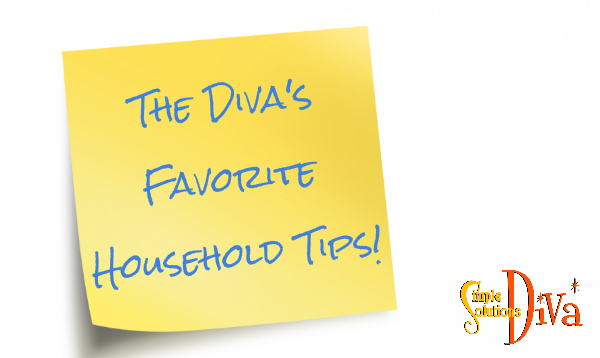 In honor of her LIVE appearances at the 2016 Fall Jacksonville Home + Patio Show, the Diva is sharing her favorite, simple household tips! Come out and say “Hi” on Sunday, October 2 at 11:30 a.m. – The Diva will be cooking things up on The Jacksonville Magazine Cooking Stage! If you plan to go to the Jacksonville Home + Patio Show, use promo code DIVA to get a discount on your tickets when you buy online! Buy Tickets HERE. 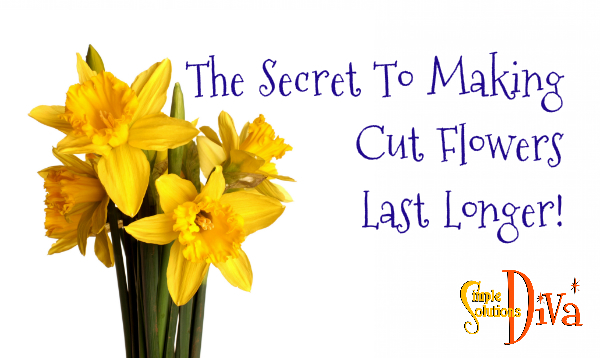 The Secret Way To Make A Room Smell Great! 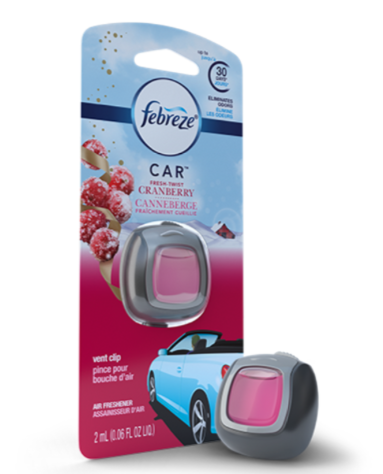 – Try adding a Febreze Car Vent Clip to your air conditioning vent in a room – rarely do people look up when they enter a room, so it is a great way to make a room smell great, without being too heavy a scent! Available at Pubix, Target, Walmart and more. Or, you can also add a few drops of your favorite essential oil to your air conditioning filter when you change it out every month. 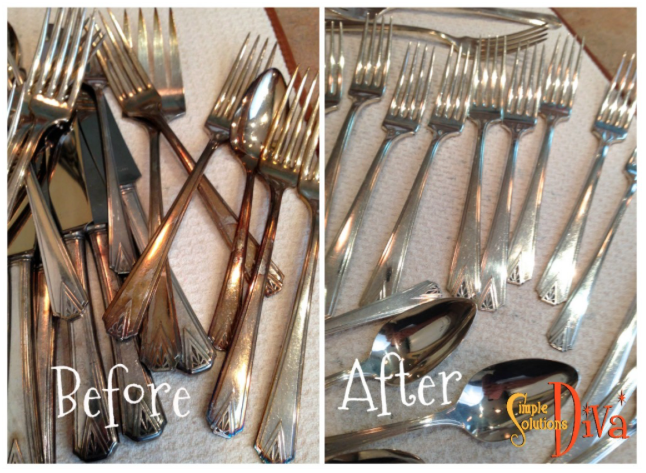 Simple Way to Clean Blinds: Tongs & Microfiber cloths! 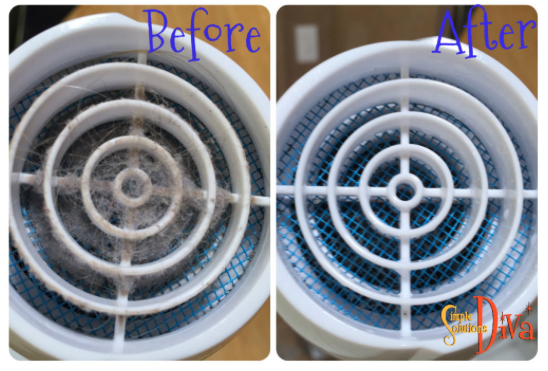 Wrap a microfiber cloth around each end of tongs, secure them with rubber bands, and you have a simple tool to clean those blinds! Toss the cloths into the wash when done! How To Clean A Wooden Cutting Board: Lay the board on a clean work surface. Sprinkle the cutting board with salt. Using half of a lemon, place cut side down on the board and rub in a circular motion, combining the lemon and salt. The salt gently removes any built up grime, and the lemon naturally sterilizes the wood. 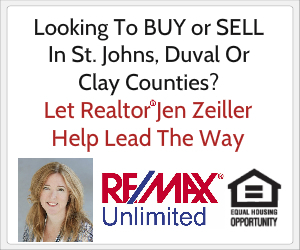 Thank you to WTLV-TV’s First Coast Living for having me on to share these tips! 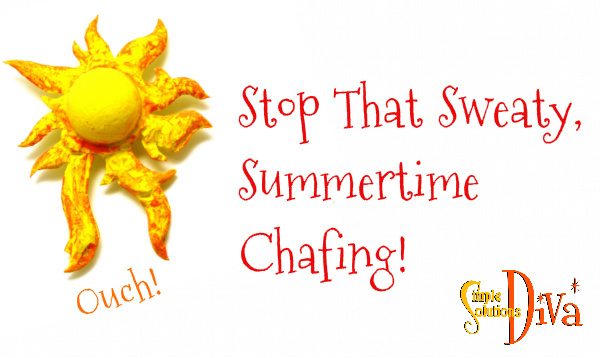 Stop That Sweaty, Summertime Chafing! This is your summertime PSA, and you are welcome! Thigh Gap: When Thighs Don’t Touch When Standing with knees together – usually someone who is 95 pounds and 2% body fat! AKA: Something I haven’t experienced, I don’t know, since maybe I was 8 years old! I was inspired to do this post while on a college tour with my youngest. It was extremely hot and humid, and my skort (skirt with built-in shorts) was not keeping my thighs from rubbing together! Talk about uncomfortable! So when I got home, I decided to find out how to prevent that chafing. My friends who are runners & bikers probably know this already, but it was all new to me! So if you, like me, are not aware of how to stop the bane of summer, enjoy and learn! You are welcome! 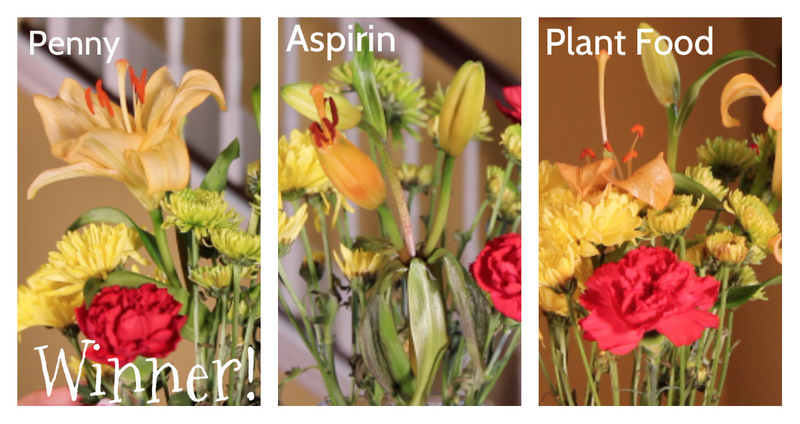 HGTV and other shows make DIY look so easy! The reality is, it isn’t always so simple. 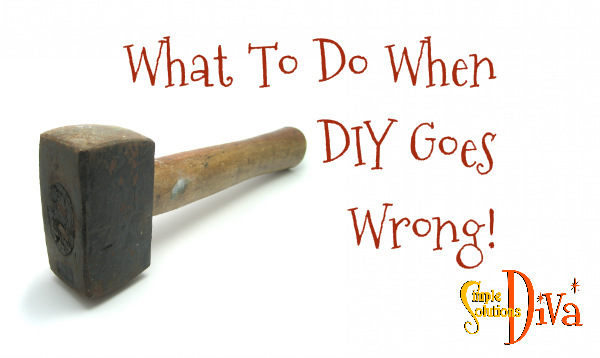 So what do you do when DIY goes wrong? 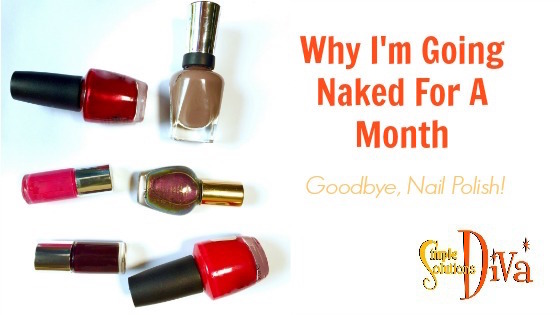 Check out the video above for the Diva’s recommendations! 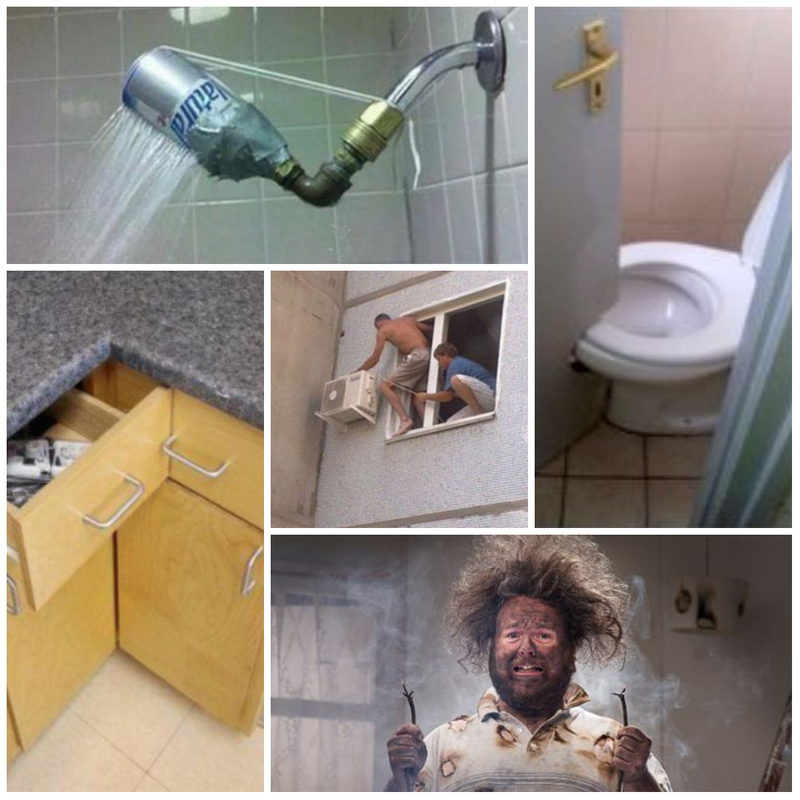 Epic DIY Fails From Around The Web! What Is Your Ideal Mother’s Day Celebration? So do you have a favorite tip? One that always works? Share it with the Diva at info@simplesolutionsdiva.com! What Do You Do With That Bonus Day?! Leap Day: That odd day that shows up every four years to “fix” our imperfect calendar! (Thanks, Pope Gregory XIII!) 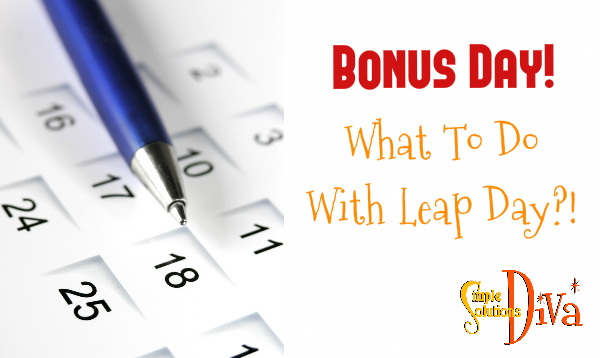 So what should you do with that wonderful Bonus Day? 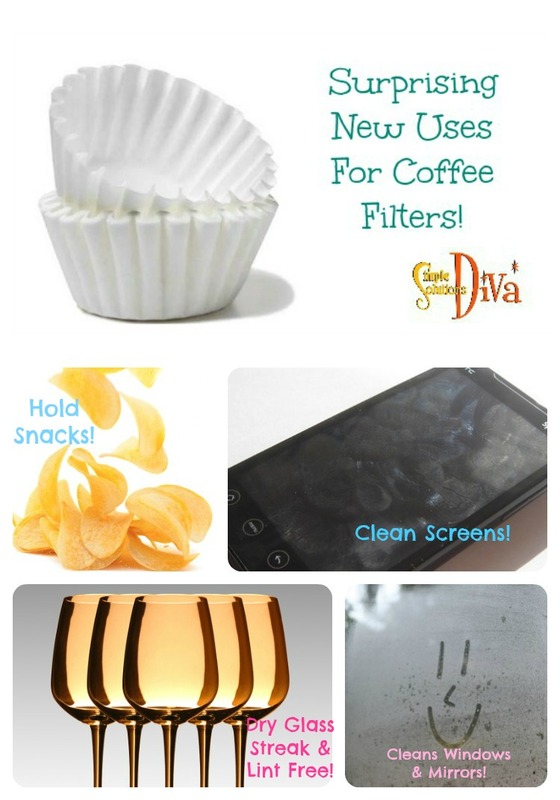 Simple Solutions Diva has the answer!